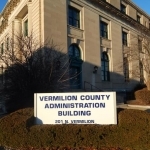 Vermilion County voters on Tuesday determined the outcome of some county board races. In County Board District 1, current chairman Larry Baughn Jr. and Natalie Duncan, both Republicans, won without opposition. Also in District 1, Joel Bird was elected to fill an unexpired term. In District 2 the winner was Republican Daniel Wright. In District 3 Joe Eakle and Steven Fourez were elected. Wesley Bieritz was re-elected to the County Board in District 6. Democrat Phearn Butler was re-elected in District 8.
the County Board in District nine.